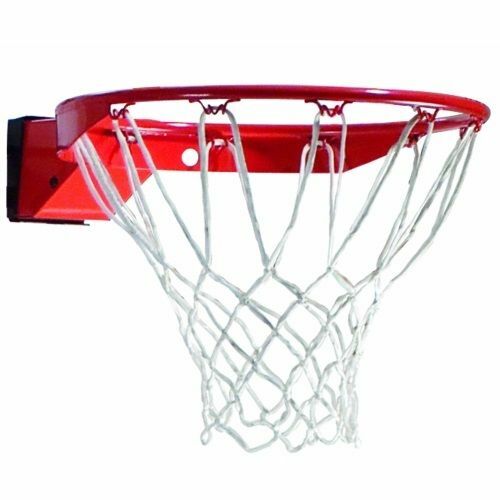 Spalding Portable Basketball Hoops 68454 54 inch Glass Backboard Goal System. Daily giveaways up to $20 just for liking us. Spalding Portable Basketball hoops provide an excellent solution for when you need to move your system around regularly. The 68454 takes it a step further by giving you a glass backboard making it one of very few consumer end portable systems that does. 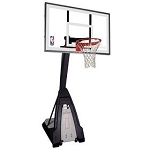 The 4 inch square pole on this system also makes it one of the most stable portable units in the market as most portable basketball goals have only a 3.5 inch round pole. The 40 gallon base on this system assures you great stability while players are at play. 54 inch wide x 31 inch high, tempered glass backboard. Tempered glass measures 1/4 inches thick. Glass backboards provide a superior rebound when compared to acrylic or polycarbonate backboards. Four point welded Z-arm board mount provides increased stability and goal reinforcement. Comes with a backboard pad, providing enhanced safety for players and support for the backboard. 1" x 1" steel frame surrounds the backboard. 4x4 inch, 3-piece square pole. Square poles provide greater stability compared to round poles. Pole is supported by a 4-strut mounting to the portable base. 40-gallon portable base can fill with sand or water to help stabilize the unit during play. Screw jack lift mechanism provides infinite height adjustments between 7.5 ft. and 10 ft. Product comes with a factory honored warranty. 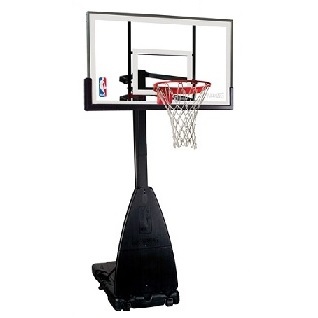 Product comes with an arena slam, breakaway rim and an all-weather net. Product Packaging Dimensions: 56.30" x 36.70" x 18.90". This product is shipped via an LTL carrier using a curbside delivery. This means the driver will bring the order to your address and then will require assistance unloading the product. 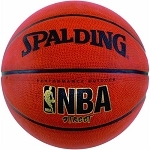 Competitive Edge Products is an authorized reseller for Spalding Portable Basketball Products. If you find this model, 68454, cheaper anywhere else online, please let us know. We will try to match or beat their price. I am very pleased with this purchase. The glass backboard is one of the key attributes, along with the handle which makes it easy to adjust the height from 10 feet to lower for smaller kids. Though it took two competent adults about 5 hours to assemble, the instructions were relatively straightforward, though I would recommend using two sawhorses to make it easier. The unit is very stable when filled with water/sand, and it the bounce off the backboard and rim is just like being in the gym. The salesperson on the phone was very helpful when I made this purchase, it was delivered in a week to my house in good condition. This is our second portable hoop in five years. We have it in our driveway. The glass backboard makes this one a much better goal system than our previous shatterproof backboard goals. The screw jack system for adjusting the height of the basket is easy and simple. It took two adults about 3 hours to put together. Very straight forward to assemble if you follow the directions. I am very satisfied with the purchase price and the product. I purchased this hoop and timely received it on 2/5/13. We decided to pay someone to assemble it. We started our quest for a portable hoop for our 2 sons both under 12. After traveling from sporting good store to sporting good store and testing out all the hoops we decided that we wanted to purchase the Spalding beast but it was way out of our price range at about over $1000. All of the other acrylic based backboards which were slightly smaller than this one was very shaky and rocky if you through a basketball at it. We decided that we wanted to invest in a slightly more expensive and better quality hoop types since our sons will be using it for very long time But did not want to pay $1000. This hoop is amazing and has a real glass backboard. My sons are in love with it and it is going to last us a long time and was worth the investment. Q: Can someone slam dunk on this hoop without breaking it? Q: Can I buy a replacement base water tank marking on tank GBV66B? A: Please call 1-800-558-5234, and give them the model number of the product, for replacement parts. Q: How is the Pole Supported? A: The pole is supported by a 4-strut mounting to the portable base. Q: Does this include installation hardware? A: This includes all of the necessary pieces and parts along with hardware such as an Allen wrench; however, a electric screw driver may help speed up the process. Q: We purchased this a year ago. About 2 months ago, the base cracked open, and a chunk came out. Is there any warranty on this? With tax it was $598.00, a bit pricey for less than a years use!!! A: You'll want to contact Huffy at 800-558-5234. Q: How much sand does this require? A: It can hold 40 gallons of sand. Fast Shipping: Orders for the 68454 generally leave the warehouse the next business day. Delivery Details: This product ships directly from the factory in Alexander City, AL. Delivery of this product is via a curbside delivery through an LTL carrier (too big for UPS and FedEx). The customer must be present to sign for the order. The freight carrier is instructed to contact you prior to delivery to set up a delivery appointment. Dimensions: 56" x 37" x 19"